By Clark Bates| It might seem that a claim like the one in the title of this article is a bit far-fetched. 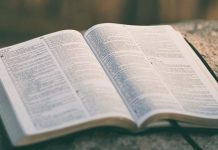 After all, how could I, or anyone for that matter, assume which word, or words, in all of the New Testament are the most important? Surely, each reader has particular words or phrases that mean the most to them. To claim that there is only one word that is most important for all Christians would be like telling the church that there is only one Bible verse that everyone should feel is their “life verse”. Recognizing this up front, I should probably explain what I mean. I’m not suggesting that you, as an individual, cannot or should not have particular words that resonate with you. 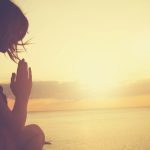 Perhaps you find great power in the word “justification” (δικαιωσις) because it conveys the imputation of God’s righteousness to salvation upon you. 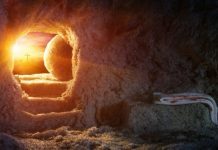 Maybe you prefer to plunge the depths of the words of Christ on the cross, “it is finished” (τετελεσται) and how forms of that word re-occur throughout the New Testament. 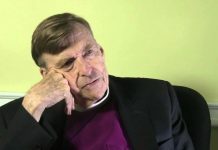 And if you have words such as these that are near and dear to your heart, I am not suggesting you are wrong about them, but the word of which I am speaking provides the framework from which all other words you may love exist. While other English translations also render this word, “inspired by God”, or the “inspiration of God”, both are legitimate renderings of this single word. 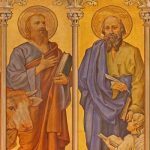 The contextual implications of Paul’s message to Timothy is that all of Scripture, primarily the Old Testament at this time, finds its source in God and derives its authority from the highest authority in all of existence. 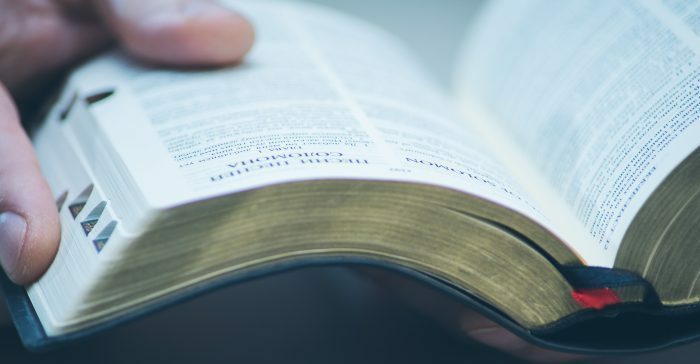 If the apostle is suggesting that all of Scripture contains the authority of God, it follows that there can be no higher authority than Scripture itself, making the very text of the Bible self-authenticating. What’s more, it is the “God-breathed” nature of Scripture that provides the meaning for all other claims made within it. The justification found from the imputation of Christ’s righteousness means nothing in the pages of Romans if there is not breath of God behind the promise. 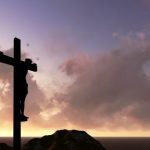 Neither can we truly understand the depth of the completed nature of Christ’s sacrifice on the cross or the process by which believers are continuously conformed to the image of the Son. For this reason, it is the θεοπνευστος nature of Scripture that provides trustworthiness in all its assertions. Does it Really Mean That? However, I cannot defend the title to this article, or even my initial assertion, without at least acknowledging that there exists opposing views relating to how this text is to be understood. The argument largely surrounds the proper placement of the second adjective, “God-breathed”. 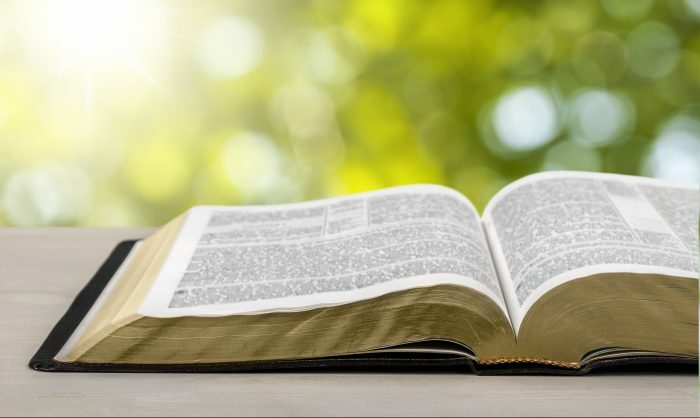 Should the text be interpreted, as above, that “All Scripture is God-breathed and profitable. . .” or should it read, “All God-breathed Scripture is profitable. . .”? While this might appear to be an argument over incidentals it does shift the understanding dramatically. If the latter interpretation is the valid one, it would suggest that Paul viewed some Scripture as “God-breathed” while others as not, and it is only those Scriptures which were “God-breathed” that are authoritative. This, of course, leaves the reader in a nebulous investigative mode, seeking to discover which texts, Paul might have had in mind. 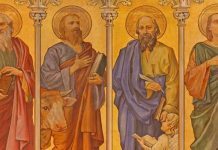 If the former interpretation is to be accepted, the assertion is, as has been already claimed, that all of what Paul believes to be “Scripture” is “God-breathed” and carries the authority of the Almighty. What makes this determination difficult is the rarity of this form of adjective-noun-adjective composition in the New Testament. Falling in line with Dr. Wallace, Kruger sees that the predicate use of θεοπνευστος as the more likely option, necessitating the insertion of an action verb separating “Scripture” from “God-breathed”. While debate will always exist over this issue (and always does in academia), the available evidence for an interpretation of 2 Timothy 3:16 favors that which is found above and in the majority of English translations. A final question that must be addressed, is what the apostle meant by “Scripture”? While much has been written on this topic, a short answer can be rendered here. As a Rabbinic Jew, the apostle Paul would clearly have valued all teachings of the Old Testament as Scripture, or divinely authoritative. Beyond this, the existence of several gospels and Paul’s own epistles would be circulating at the time of his writing to Timothy. That the Apostle thought of the New Testament writings as equally authoritative can be seen in two passages of Scripture. 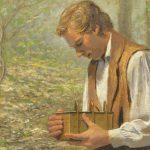 In his earlier letter to the young Timothy, Paul writes in regard to monetary support for pastors that, “the laborer deserves his wages.” This is a direct quote of Luke 10:7 and is paired with the previous quote, “You shall not muzzle an ox when it treads out the grain” a direct quote of Deut. 25:4, suggesting rather forcefully that the Apostle saw the gospel of Luke on par with the Torah in regards to its authority. The second passage is 2 Corinthians 3:6 in which he writes, “. . . our sufficiency is from God, who has made us sufficient to be ministers of a new covenant. . .” While space is insufficient here to discuss the implications of old and new covenant, it is clear that the old covenant of Moses was first given orally, being written immediately after. So prevalent was the written form of the covenant that by the time of the Kings of Israel, any mention of the “law” was referring to the written form. 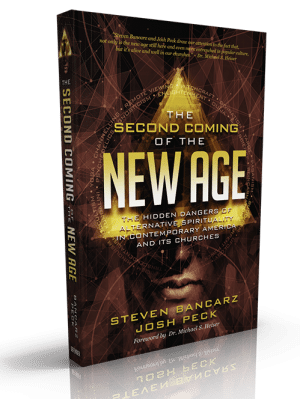 If the apostle Paul saw himself and the other apostles as “ministers of a new covenant” the expectation of it being written would clearly follow, and would come from those who were acting as its ministers. Therefore, while it may be stated that the “Scripture” in mind at 2 Timothy 3:16 most certainly indicated the Old Covenant writings, the Apostle Paul surely had in mind the writings of the New Covenant, still in production. The conclusion of this is nothing less than the affirmation by the apostle Paul that all that we know now as “the Bible”, both Old and New Testaments, carry divine authority, coming from the very mind of God. 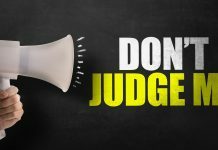 Every apologetic endeavor I’ve ever engaged in, and every apologetic interaction all believers engage in, always come down to this one question, “Has God spoken or has He not?” As believers and apologists, we seek to guide others through the Christian worldview of a variety of current social issues. Whether we are defending the sanctity of life or the sacredness of natural marriage, it must always return to the breath of God, for if Scripture is not grounded in the ultimate authority of God, there is no ultimate grounding for the Christian worldview. All believers find great security in various parts of the Bible. We treasure certain verses, sometimes entire books. As in the introduction, many often cite certain theological doctrines as their source for encouragement. Every aspect of Scripture is to be treasured, but none so greatly as the realization that it is God-breathed. For in this one word is found all that Scripture is- the Word of God, handed down to mankind through the prophets and apostles, and the sole infallible authority for all the church, making θεοπνευστος the most important word in all of Scripture. BDAG, 356. Or see Timothy Friberg, Barbara Friberg, and Neva F. Miller, Analytical Lexicon of the Greek New Testament, (British Columbia: Trafford Publishing, 2005), 196. For more in-depth understanding of what is meant by a “self-authenticating” Scripture, I recommend reading Michael J. Kruger, Canon Revisited: Establishing the Origins and Authority of the New Testament Books; Meredith G. Kline, The Structure of Biblical Authority; and B.B. Warfield, The Inspiration and Authority of the Bible. And from Goheen, Michael. “The organism of revelation.” 1996b) pp (2002): 331-345, “Theopneustos refers to the divinely authoritative message concerning salvation that has come from God and is recorded in the Scriptures. Inspiration refers to the process by which that Scripture has come into being while theopneustos qualifies the Scripture as a finished product. Theopneustos is concerned with the divinely authoritative message in the Scripture while inspiration is concerned with how the Spirit brought that message into being in the human authors. Wallace, Daniel Baird. 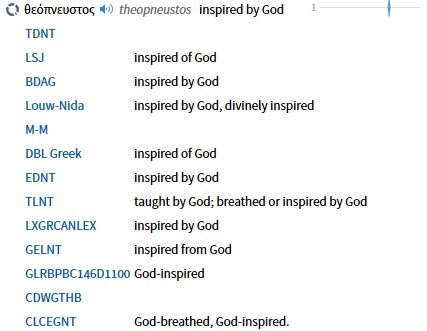 “The relation of [Theopneustos] to [Graphåe] in 2 Timothy 3: 16/Daniel B. Wallace.” (2005). Ibid., For those with at least a rudimentary understanding of koine Greek or curious how issues such as this are resolved academically, I strongly recommend Wallace’s article. It is fairly technical however, and may result in more confusion than clarification for the untrained reader. Ibid., italics added for emphasis.